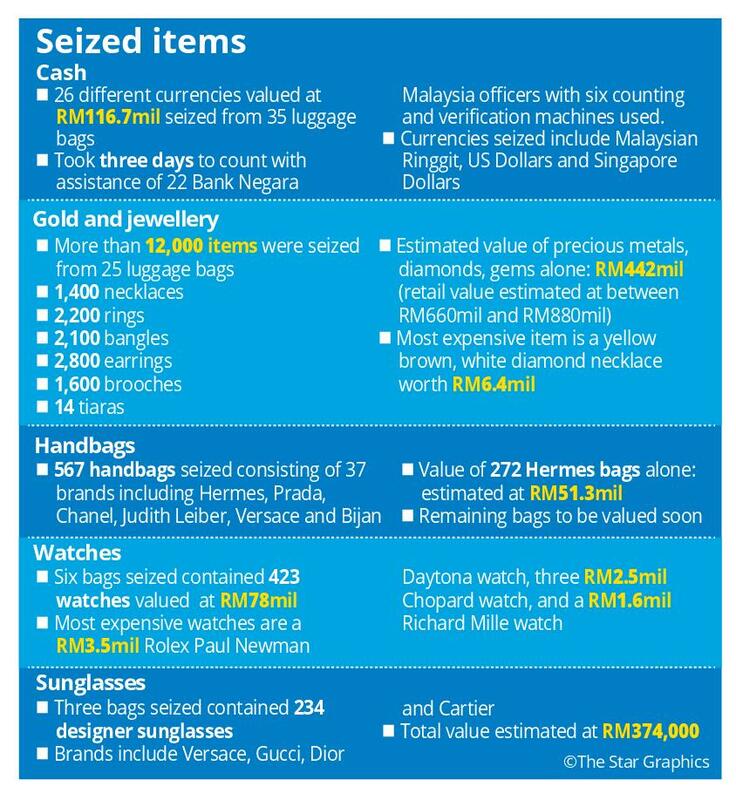 PETALING JAYA - Datuk Seri Najib Tun Razak has claimed that the valuation of items, particularly jewellery, seized from several residences linked to him are "subjective and unrealistic", adding that many of them were gifts from foreign leaders and friends. "It depends on the source of the stones and when they were gifted or purchased. "Valuation can tend to differ," he told Malaysiakini in an interview yesterday. He said he hoped to examine the items seized to allow for an explanation as to how they came about. However, he conceded that like any husband, he was not aware of the extent of his wife Datin Seri Rosmah Mansor's collection of jewellery and other items. Furthermore, he was not provided with the full and detailed list of the items seized during the raids carried out since last month. Najib said he was furnished with an incomplete list with vague descriptions and without photographs of the seized items. "But what I do know is that over the years as head of the government, we have been gifted with a lot of items by foreign leaders as well as personal friends, and I do know that under the law it is not illegal to receive gifts. "These gifts were accumulated over a span of decades," he said, adding that Tun Dr Mahathir Moha­mad admitted to receiving 40 horses as gifts from his friends and foreign leaders. Pressed on his statement that it was not illegal for him to receive the gifts, Najib said: "If the gifts are given to you by other heads of state on occasions such as your birthday and nothing is expected in return, it is not illegal." He said he had planned to include these gifts in his galleria at some point in time. He said Rosmah herself was surprised by the number of items. "I think the valuation... she doesn't believe it will come up to that amount," he said. He added that some of the jewellery sent for viewing needed to be returned to the jewellers. "We need to identify these items and return them," he said, adding that jewellers had written in to legally claim back their items. Najib said a sizeable amount of the jewellery seized did not legally belong to Rosmah; it belonged to their daughter Nooryana Najwa, her husband and her mother-in-law. He also claimed the RM116mil in cash recovered during the raids was for general election expenses. Najib arrived at the Malaysiakini office at about noon and left at 2pm. He left his house at Jalan Langgak Duta during Comm Amar Singh's press conference. Najib did not speak to journalists who were waiting outside the Malaysiakini office when the interview was over. It was learnt that the interview centred around the 1MDB scandal and the cash and items seized.